DE ROSSI - Penisola dell India di là dal Gange et Isole intorno ad essa adiacenti..
DE ROSSI, G. - Penisola dell India di là dal Gange et Isole intorno ad essa adiacenti..
Penisola dell India di là dal Gange et Isole intorno ad essa adiacenti.. - DE ROSSI, G.
Map maker : DE ROSSI, G.. Size : 20.9 x 16.1 inches. / 53.0 x 41.0 cm. 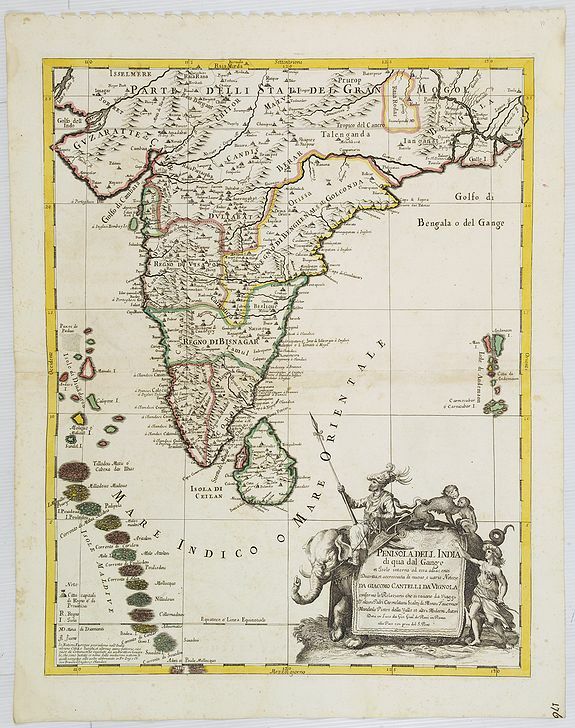 Description :Giacomo Rossi's fine late 17th century map of India with Ceylon and Maldives. Issued in Il Mercurio geografico In lower right hand corner a large title cartouche with dedication to Tavernier and Mandeslo, supported by exotic Asian figures and surmounted by an elephant. The cartographer was Giacomo Cantelli da Vignola(1643-1695) who was active in Modena in Italy.
. The principal settlements, mountain ranges and rivers are shown in detail. Engraved by Franciscus Donia. RARE. Condition : Some very minor marginal spotting. Discolouration along center fold. Dark impression. Very good.